In 2015, the Environmental Protection Agency proposed its Clean Power Plan (CPP), designed to reduce carbon emissions. While we comply with all current environmental regulations, the CPP proposal would have had dire economic consequences for Arizona G&T Cooperatives and would have unfairly raised electric rates for rural people across the nation. Today, as a result of favorable court rulings and a change in the administration in Washington, D.C., the threat posed by the CPP has diminished. At the same time, improvements we’ve made to Apache Station, including converting one of our two coal units to natural gas, are reducing carbon emissions. However, carbon regulation isn’t going away entirely. We continue to engage with our allies around the country to ensure that any new rules take into consideration the unique position of co-ops and other not-for-profit public power entities. Meanwhile, we now have additional time to prepare to meet any new carbon rules put forward in the future. Aug. 3, 2015: The EPA releases its proposed CPP. AzGT joins with other electric co-ops in a substantial effort at the grassroots level and in contacts with regulators and lawmakers. Oct. 23, 2015: The EPA publishes the CPP in the Federal Register and it becomes law. The nation’s electric co-ops file a lawsuit against the rule and request a stay against any new regulations until the case is decided. Feb. 9, 2016: The U.S. Supreme Court grants the stay. March 28, 2017: President Donald Trump signs an executive order directing EPA to review the CPP, and establishing a process to repeal or revise the rule. Two days later, new EPA Administrator Scott Pruitt advises governors they aren’t obligated to adhere to the CPP. 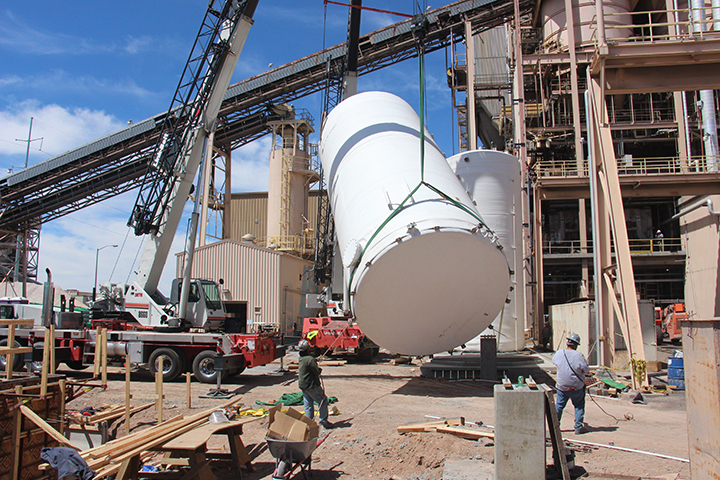 Workers install the second of two urea tanks during the overhaul on Steam Unit 3. Many of the upgrades made recently will help reduce carbon emissions.